Because of the rash of ill-founded attempts online to hook up Jews, like JDate, JMatch, JewishMate, Jtrue, JewHarmony, Heebhookup, Sawyouatsinaitemple, Mustlovekugel, JShtup, JewishAdultFriendFinder, HotYiddishMaidel, MarryForMoney, SemiticSex, and many many more, I realized that we need to promulgate the real Jewish views on dating in order to guide the future generations of Jews on the West Side of Jewhattan, some of whom are already third generation singles. Learning a chapter of this book each morning will help all Jews. 1. Though everyone feels qualified to be a shadchan, one must exercise great caution. 2. Children born of marriages arranged by untrained shadchanim, G-d Forbid, decide to work, and not learn full-time. 3. Most matchmakers are in it for the money, therefor poskim agree that you should sign pre-shidduch agreements, limiting the amount they can charge. served. Some say it can be even after desert. 5. Min Ha Torah, Parents have no right to veto or approve potential shidduchim. However, Rabbinically, they can veto a shidduch for any good reason. 6. Speed dating, on-line dating, virtual dating, single-socials, venues where singles may meet, Heaven Forbid, and personal ads are strictly forbidden, because aino makom l’bnei melech. They are permitted in Teaneck. 7. 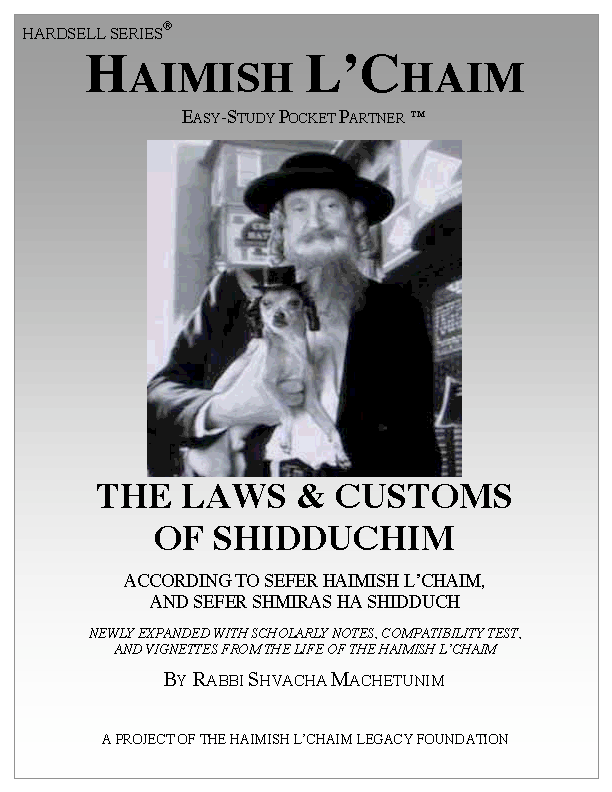 One must first ascertain that you know very little about the potential shidduch, so that you will be impartial. 8. Most authorities permit knowing just a little bit about the other party, however, this is only in a case of hefsed merubah. for quick get-rich schemes and fail to take into account the responsibility. of our glory, the rebuilding of the Temple, and an end to the Exile. Catch Me A Catch, for a suggested pre-shidduch agreement text. 4. See Inyanei Chatunot, by HaRav HaGaon I. M. Broke. 6. Somewhere it says this, trust me. is forbidden for all B’nai Yisrael, who are Children of Hashem. guess Hashem? Who made you so high and mighty?” See Mussar For Dummies.